Now that you’ve been schooled in the art of writing a funny tweet (the original fun-size and the updated Costco-size version), let’s take word counts out of the whole equation. If you’re building your comedy brand, you’ll want to think seriously about Instagram. It has more users, and its platform boasts higher engagement than Twitter. Translated into human-speak, that means more people, particularly people your age, are going to see you there. So. You’re on Instagram, and you’re funny. What do you do? There are a few different options: You can use it to showcase your cartooning talents, which is great. You can use it as if it were Vine 2.0, creating short snippets of video hilarity. Also great. But what I want to dig into here is how to create a joke that depends on the image, and is deepened with your commentary. This is different from a meme: Memes have text written write on top of them. Boom. Instagram comedy is a little more nuanced, and takes a little more time; viewers will look at the image, which is the setup. Then they click, and get the punchline. See? It’s a joke. Chelsea Peretti of Brooklyn 99 is great at these. In this one, she’s copping to being that person who cannot be told not to do things, because that will just make her do the thing even harder. It makes me laugh and it makes me identify with her. Another kind of joke: The collection of oddities. 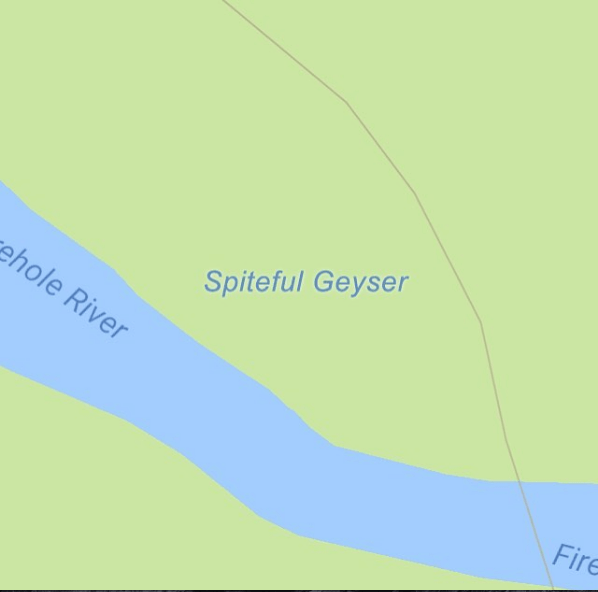 There are lots of these on Insta, but my personal favorite is called “Sad Topographies.” It’s as simple as it is brilliant: Images of real place-names in that are totally devastating. Anything you’re fascinated with, you can collect and reproduce in this way, as long as you credit the source and honestly, enthusiastically adore your subject. I’ve got a file of lamps from David Lynch movies and TV shows waiting for me to have the time to categorize and upload them one by one. What’s your obsesh? Share it. This account, @poundlandbandit, creates composite images that illustrate a concept. 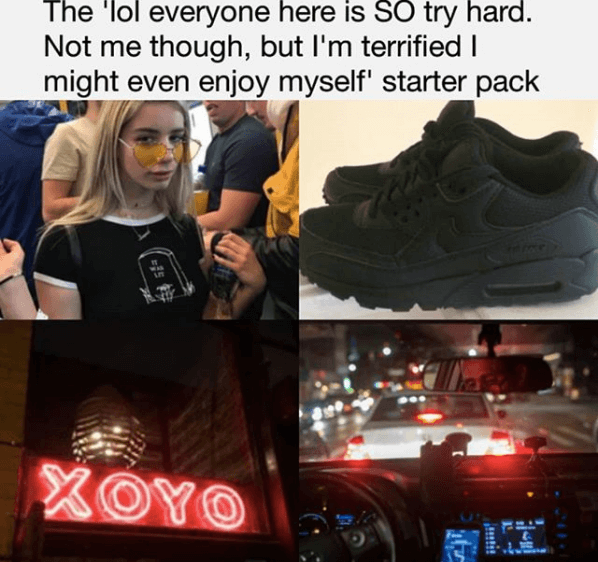 It can take a minute to get into it, and some of the jokes thud with Americans because the ideas are Brit-based, but goddamn, when it works – as in this joke, about that one girl who goes out to the club and just acts miserable, but for why? But she does – plays on common experiences that connect us all in misery and hilarity. If you’re thinking of getting started being funny on Instagram, I would love to give you some pointers. When writing a joke, you walk around with a notebook and write down things that strike you as funny, so that you can think it over later and develop it into a bit. 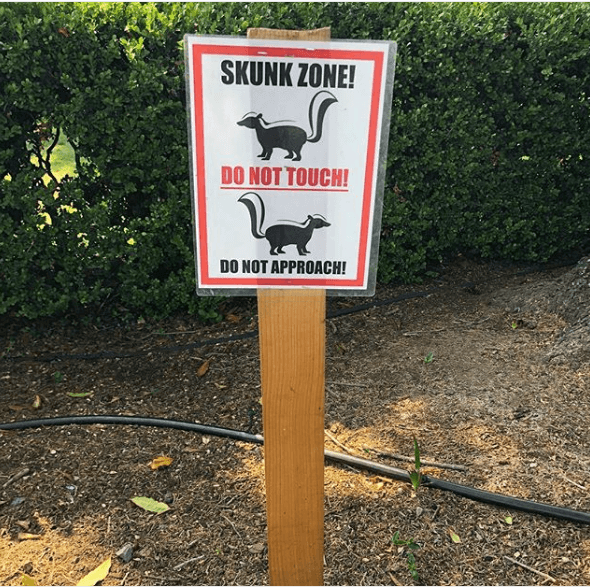 Visual bits work the same way: I take pictures of things that strike me as odd, ridiculous, incongruous, or just plain amusing, and later, I look them over and try to think of how I can deepen the joke with words. Here’s an example. 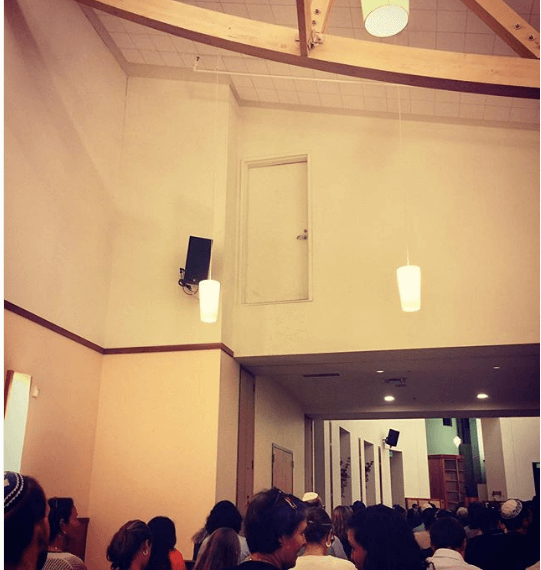 My synagogue has this odd little door in a wall high above anything that could possibly serve as a floor. (Never mind that I clearly snapped this photo in the middle of Rosh Hashonah services. Obviously I apologized on Yom Kippur.) So the image itself is surreal and amusing, and would have been fine on its own. But I thought it over, and first typed “This is where I go when I want to get high.” But 420 jokes are kind of stale. Next, I thought of “I really hate visitors.” Still didn’t do it for me; I’m a little tired of introverts announcing what introverts they are every other minute. I thought about a Rapunzel joke, but I finally settled on “I said where’s my pizza?” For me, this hit a sweet spot and told a tiny story about a woman who is sick and tired of people not being able to reach her unreachable home. I love thinking about that woman. I think that sometimes, we are all that woman. There used to be a game we played at UCB called “stab the joke in the face.” I don’t know if they still play it, and I can’t remember what it consisted of beyond flogging a dead joke until it was pulverized dust. From that dust, you often find gems forged of pure desperation. And that, my friends, is comedy. Speaking of texting my dad, my next example is pure Dad Joke. I know for a fact that my dad would love it because I did, in fact, text it to him. 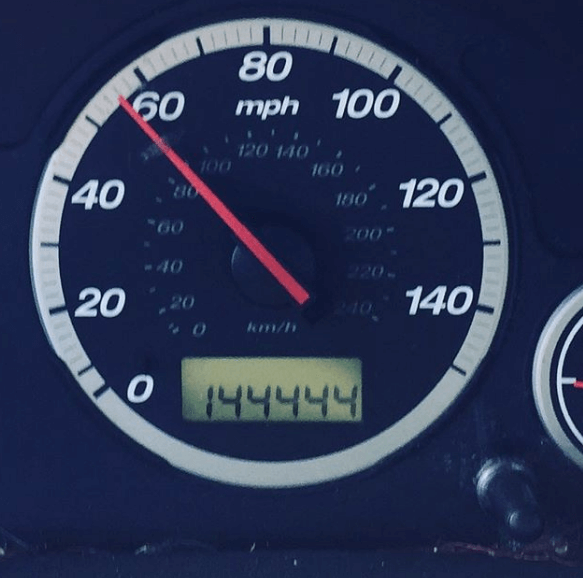 I snapped the picture because I just thought it was bizarre to see all those fours in a row like that. But what to say about it? A 2/3 of Satan joke? I was stymied and about to fall back on just being plain-old stunned into wonderment, when I realized that “what’s it all for” could so easily become a painful pun. Sometimes the jokes are so bad, they’re good. You be the judge. In this case, I found a worry doll in the kitchen and noticed that it had a baby, and the baby was giving me side-eye. I am ALL ABOUT babies giving me side-eye. If I were a baby (and some might argue that I totally am a giant baby, and where, I ask you, is the lie? ), I would give everyone the side-eye, because being a baby is 100% bullcrap. 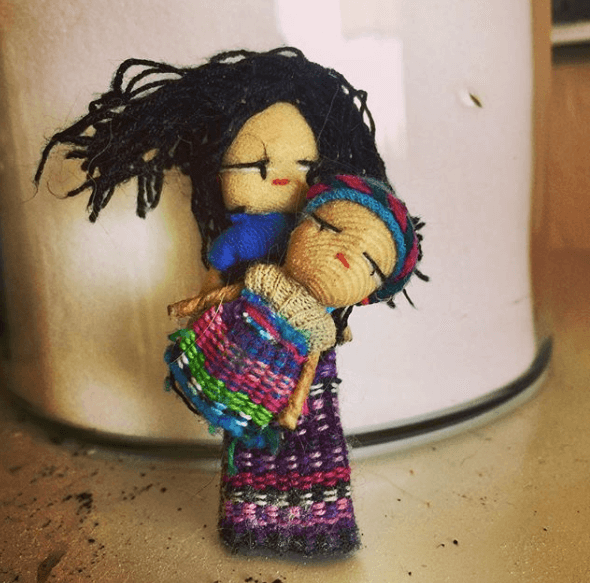 Actually, this particular pair of worry dolls tells a story, too: The mom is giving side-eye to the baby, who is giving side-eye, or disdainful front-eye, to the viewer. I simply titled it “This worry-doll baby has zero time for your nonsense” to let the viewer know that (a) I know they are worry dolls, (b) The worry dolls’ expressions amuse me, and (c) I know exactly how that worry doll feels. Now that I look at her again, the worry doll might be flinging herself in front of her mother to protect her from an errant laser beam, something she is very tired of having to do. Also, the mom might be Beyonce because her hair is blowing back for unknown and obviously glamorous reasons. In sum: If you don’t feel like your Twitter jokes are landing, try another platform, and another form of joke. Your voice might need a different kind of mic. What’s your favorite visual joke? Send us a thousand-word image.